Peter Costello is Managing Director of ECG Financial Pty Ltd, a boutique corporate advisory firm with offices in Canberra and Melbourne. A former barrister and counsel in some of Australia’s best-known industrial disputes, he was first elected a Member of the House of Representatives for the seat of Higgins in March 1990 and subsequently re-elected on six occasions. The Deputy Leader of the Liberal Party of Australia from 1994 to 2007 and the Treasurer of the Commonwealth of Australia from 1996 to 2007, he is the longest serving Treasurer in our nation’s history. 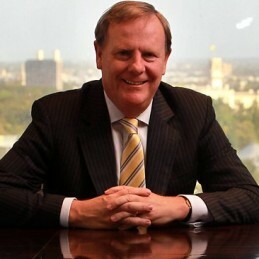 Peter Costello brought down 12 consecutive Federal Budgets, including 10 surpluses. During this period he eliminated the Commonwealth Government net debt of $96 billion. He introduced the largest tax reform in Australian history called: A New Tax System, which introduced GST, abolished seven taxes and reduced income, capital gains and company taxes. Since leaving Parliament in 2009 Mr Costello has served as Chairman of the Independent Advisory Board to the World Bank in Washington. He is a Director of the Nine Entertainment Corporation and Chairman of the Future Fund, now holding over $100 billion in assets. He published a best-selling autobiography in 2008 and in 2011 he was made a Companion in the Order of Australia. He is currently a Member of the Independent Advisory Board to the World Bank in Washington. Peter holds degrees from Monash University where he was, for a time, a part-time teacher in law and economics/politics, as well as a member of the University Council.